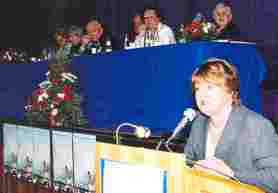 The Annual meeting of the Irish Senior Citizens Parliament was held on the 13th & 14th April 2007 . Three hundred delegates representing the Parliaments 90,000 members gathered to review the Annual Report of the years work on behalf of the Parliament and to develop new policies for the future. The year had been marked by the participation of the Parliament in Social Partnership. For the first time Older Peoples representatives were admitted to membership of the Community and Voluntary Pillar and played an active part in negotiating the new programme ‘Towards 2016’ which contained a section dealing with Older Peoples issues including a commitment in the agreement to publish a ‘Green Paper’ on Pension Policy which is long overdue given the relatively poor position of pensioners in Ireland against their counterparts in other European Union. On Friday night delegates attended a dinner and a social event with a live band. Northern Ireland: He welcomed recent events in the peace process and expressed the wish that the ties between the Parliament and Older People’s groups in Northern Ireland would be strengthened. He placed on record his thanks to the Vice-President Paddy Donegan and the staff of the Parliament for all their work. Our membership continues to grow and we now have 380 affiliated groups and 100,000 members. Income and health care continue to be core issues dealt with by the Parliament. From September 07 women who worked in the home will be paid their entitlements directly. Social Partnership Agreement: He commended two sections in “Towards 2016” to delegates Section 32 on Older People as part of the Lifecycle Framework and Section 8.8 on the Green Paper on National Pensions Policy which will be published soon. The Parliament will be involved in the widespread consultation on the Paper and Michael O’Halloran CEO as a member of the Pensions Board will be a strong voice for our cause. He welcomed the establishment of the Task Force on Active Citizenship of which our Hon. Secretary, Sylvia Meehan is a member. Atlantic Philanthropies: An agreement covering a period of four years was signed in March with Atlantic Philanthropies. It covers an agreed work programme and a grant of €811,000. Through their Ageing programmes, Atlantic seeks to transform how ageing and older people are viewed by society and to bring about lasting improvements in the lives of older adults. The agreement provides for additional staff and resources to strengthen the Parliament at National, Local and Divisional level. It is a challenge as well as an opportunity. In conclusion he said, never before was a “Strong Voice” for Older People more needed. You are currently browsing the archives for the APM 2007 category.